Indonesia ended the period of history in the year 400 ad. Yupa is proof that the people of Indonesia have been acquainted with the writing. Yupa is a stone pillar to tie animals. On the side of the stone inscriptions of the Kingdom of Kutai. So, Kutai is the first hindu Kingdom in Indonesia. Kutai is located on the brink of the river Mahakam, East Kalimantan. 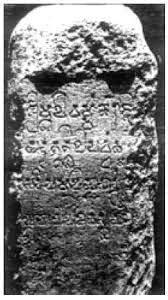 Yupa written using Sanskrit and using the letters pallawa characters in name kings kutai written in Yupa, such as Kudungga, Aswawarman, and Mulawarman. It is suspected, Yupa made in the fourth century in the time of king Mulawarman. Kutai was established by the emperor kudungga. Name kudungga is name of indonesia is born in the land - Founder of the dynasty is aswawarman. Aswawarman name had been influenced by Hindus. It is suspected, the name Aswawarman given by brahmana. King Mulawarman is king largest Kutai. he was highly respected people, and have good relations with brahmana. King Mulawarman very generous. In compensation He 20,000 cattle to brahmins in waprakecwara. it can be concluded that, the king a Hindu Shiva. Kutai People very wealthy. they were involved in a competitive world timber trade in southeast asia, because the location kutai strategic trade routes in China and India. 0 Response to "The first Hindu kingdoms in Indonesia"